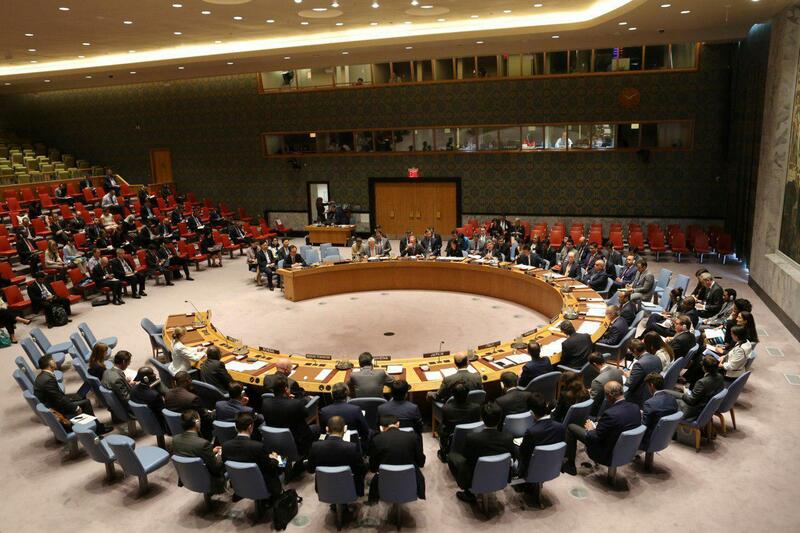 UNITED NATIONS, April 14 (Xinhua) — The U.S.-led allied attacks on alleged chemical weapons facilities in Syria sparked an emergency UN Security Council meeting on Saturday and a failed vote on a resolution condemning the raids. The rare Saturday session was convened at Russian request only about 14 hours after the U.S., British and French bombardment began. The allies attacked Syria following reports of alleged chemical weapons use in Douma near the capital city of Damascus on April 7, despite the arrival of a Fact-Finding Mission in Damascus on Saturday. On the meeting, UN Secretary-General Antonio Guterres expressed his concern and called for adherence to the UN Charter and international law on the issue. "It is my duty to remind member states that there is an obligation, particularly when dealing with matters of peace and security, to act consistently with the Charter of the United Nations and with international law in general," he said. "The UN Charter is very clear on these issues." He urged all member states to show restraint in these dangerous circumstances and to avoid any acts that could escalate matters and worsen the suffering of the Syrian people. The draft resolution to condemn the military strikes failed to gain the necessary nine votes, plus no veto by any of the five permanent members including Britain, China, France, Russia, and the United States. Three of the 15 council members — Russia, Bolivia and China — voted in favor. Four countries — Equatorial Guinea, Ethiopia, Kazakhstan, Peru — abstained. The remaining eight members voted against it. The draft resolution contained only five paragraphs condemning "the aggression against the Syrian Arab Republic by the U.S. and its allies in violation of international law and the UN Charter." It further demanded that the United States and its allies immediately end the military action against Syria and refrain from any further use of force in the future. 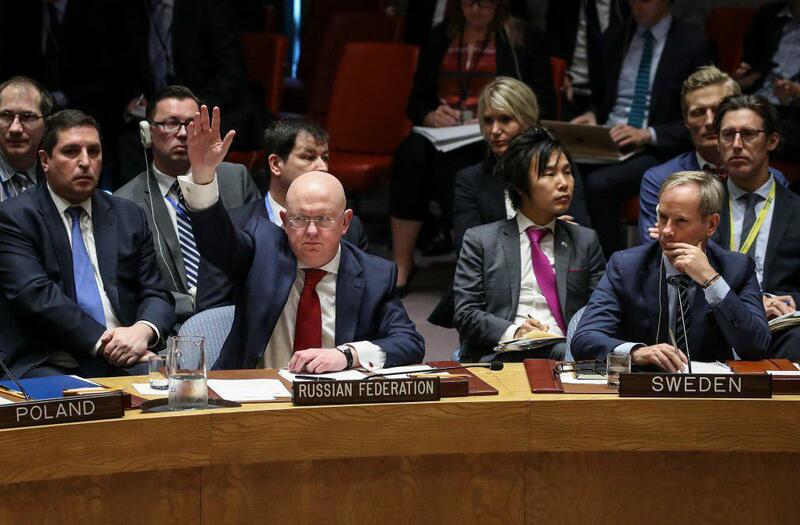 "Today is a sad day for the world, for the United Nations, and for its Charter, which was blatantly violated," said Ambassador Vassily Nebenzia of Russia after the vote, reiterating Moscow's demand that there be no further military action against Syria. Clashes already began before the vote. "This is how you want international affairs to be conducted now?" he asked, describing the attacks as "hooliganism in the international arena" and said U.S. actions lead to deterioration of the humanitarian situation in Syria. 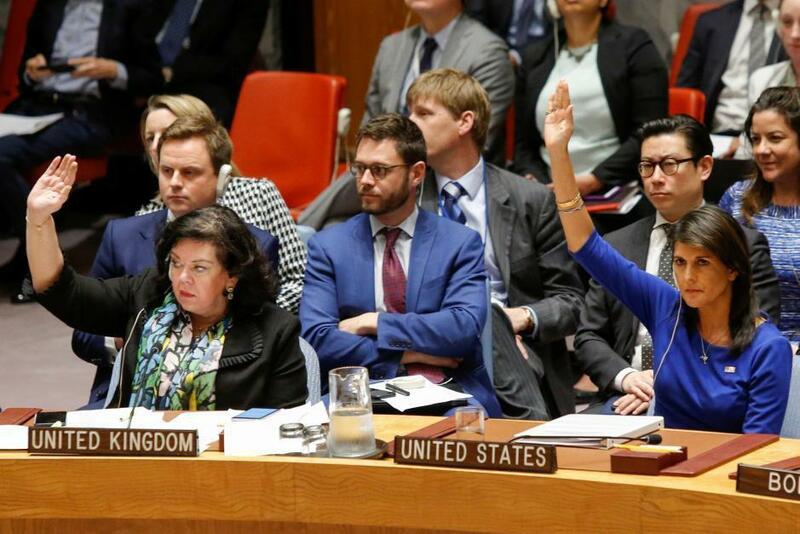 Ambassador Nikki Haley of the United States countered, "We did not give diplomacy just one chance." "I spoke to the President (Donald Trump) this morning," she said. "He said if the Syrian regime uses this poison gas again, the United States is locked and loaded." British Ambassador Karen Pierce said the joint military action against Syria was carried out on the legal basis of humanitarian intervention. Bashar Ja'afari, the Damascus envoy, said the only purpose of the three-hour Security Council session was "to condemn the trilateral aggression — the American, French and British aggression — against my country and call for the immediate cessation of this military aggression." "Any other deviation and shifting from this main purpose is aimed at killing and undermining this main purpose," he told reporters outside the Council chambers after the failed condemnation resolution. Earlier in his speech before the council, he said that a research center was damaged, and three persons were wounded near Homs. He told the council: "The air defense systems of my country countered with a great deal of bravery on the attack on my country, 100 (allied) missiles were destroyed. They did not reach their targets." The U.S. Department of Defense on Saturday has confirmed that every allied missile has hit their intended targets. "The Syrian Arab Republic firmly condemns this tripartite attack which once again shows indisputably that they (the allies) pay no attention to international law even though they say they do repeatedly," Ja'afari said. Ambassador Gustavo Meza-Cuadra of Peru, this month's president of the council, said the Russian draft resolution did not adequately reflect the need to guarantee accountability for chemical weapons use in Syria and that it did not help restore unity of the Security Council. Ambassador Tekeda Alemu of Ethiopia, whose country also abstained, said the Russian draft carried no substantial significance as it would have been vetoed anyway. Sweden's Ambassador Olof Skoog said his country voted against the draft because its language is "imbalanced, not comprehensive, did not cover the entirety of our concerns related to the current situation." He reiterated his country's full support for the UN-led political process in Syria.